How Montreal became the king of spice blends is anyone's guess, but spice maker McCormick has been selling these blends for years. There are probably hundred of recipes for this seasoning, but they are all based on the same idea. Heat and flavor without all the floral herbs of many Old World blends. Montreal seasoning hails from Montreal, Canada. It was developed from the dry rub mix that is used in making Montreal smoked meat, which is a cured and smoked beef brisket (similar to pastrami). Once someone began using it on steaks and ribs, it became popular at delis and steakhouses in Montreal. Besides using this seasoning on steaks, consider using it chicken, pork, or salmon. It's also a great seasoning to use on potatoes, including french fries, baked potatoes, hash browns, and tater tots. Use it on broccoli, mushrooms, and other grilled or roasted vegetables. You can use it in marinades as well. Combine all of the ingredients and store the seasoning in an airtight container. Note the date you prepared it to label the container. Keep in a cool, dark place for up to six months. 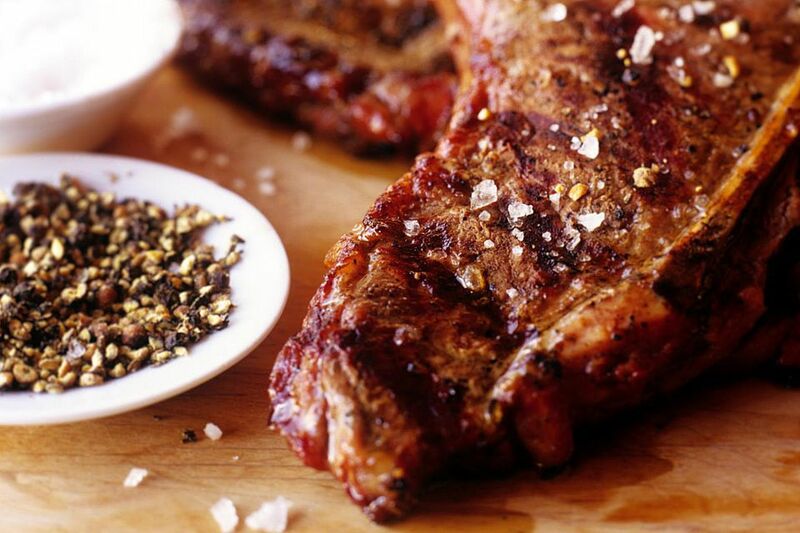 Montreal steak seasoning is an excellent dry rub for all cuts of steak. First, bring your steak to room temperature by taking it out of the refrigerator for 30 to 60 minutes. Add the seasoning (lightly or more to your taste) immediately before cooking. You don't want it on in advance as the salt will draw water out of the meat. To use the seasoning in a marinade, add 1/2 teaspoon of the mix to 1/4 cup oil, 1/4 cup water, and 2 tablespoons vinegar. Marinate the steak for 15 minutes or more in a plastic bag in the refrigerator before grilling. Be sure that you dispose of the marinade that has been in contact with the raw meat. Make fresh marinade if you wish to use it as a baste or sauce. You can modify the recipe as needed. If you don't want much heat, you can reduce or omit the cayenne pepper. If you are sensitive to onion, you can eliminate it from the recipe and still enjoy the other flavors (an advantage over buying a ready-made Montreal seasoning). For extra depth of flavor, substitute whole coriander seeds and toast them in a small skillet until they are browned. Then crush them or grind them in a spice grinder or coffee grinder before adding them to the seasoning mix.